Lewis Hamilton has, up until now, had among the best cars on the grid and he has won the championship once in 2008. 2012 was a year where Mclaren and he were gunning for their second championship with Lewis and the car having the pace to win. But mistakes in the pitlane, and some mechanical gremlins meant this also wasn't the year for his second world championship. 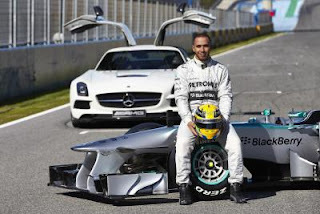 But it also meant that he would switch allegiance to McLaren's engine supplier, Mercedes AMG for the year 2013. For someone who has been part of the McLaren family since the age of thirteen, it was surely not an easy decision to take. But after retiring again, this time from the lead of the Singapore Grand Prix, and dropping from second to fourth in the championship standings, Lewis seemed to have made his decision. Whether it was the money, the chance of winning another championship, the right to keep his trophies (McLaren has never allowed their drivers to keep the winning tropies and they are on display at the McLaren Technology Centre) or a new challenge, Lewis had decided that he wanted to switch. But Tony Dodgins, highly regarded and experienced British journalist believes this switch was motivated solely on the money that the brand Hamilton can command and he was nudged into making this decision by his management team run by American Idol creator Simon Fuller. Tony Dodgins told Swiss Magazine Speed Week, "No, I think its because Lewis is strongly driven by his management. If you compare the two teams, you must come to the conclusion that there were no sporting reasons for him to leave McLaren. "Fuller is obviously a highly successful manager, "added Dodgins, "but I would not call him a racer. I'm not even sure if he is interested in the sport. No, this management is extremely money-oriented. Fuller strongly advised Hamilton to go to Mercedes, for the simple reason that he could make more money than if he was at McLaren, "said Dodgins.